Product B IsaGenesis is a revolutionary blend of complex botanicals and minerals designed to offer one of the best telomere supporting product out there today. IsaGenesis provides telomere support, fight free radicals and a general sense of well being, watch the video below for more information about telomeres. 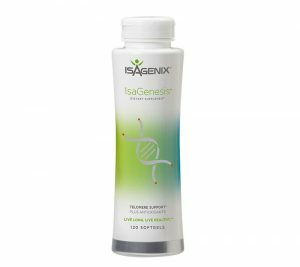 With regular use of Isagenix IsaGenesis you can also expect to experience improved absorption for better delivery to cells, neutralization of harmful free radicals that can accelerate aging, enzymes increasing antioxidant support, targeting the source of accelerated aging such as oxidative stress which may lead to shortening of telomeres. IsaGenesis is at the top of the healthy ageing market! IsaGenesis is best used in tandem with Isagenix Ageless Actives for best results. See the NEW product Complete Essentials with IsaGenesis for more information.